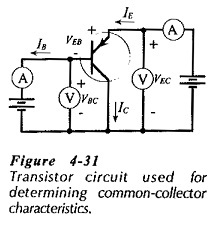 In the Common Collector Characteristics of BJT circuit arrangement of Fig. 4-31, the collector terminal is common to both input CB voltage and output CE voltage. Using this circuit, the common-collector input, output, and current gain characteristics can be determined. The output and current gain characteristics are shown in Fig. 4-32. The common-collector output characteristics are IE plotted versus VCE for several fixed values of IB. The common-collector current gain characteristics are IE plotted versus IB for several fixed values of VCE. It will be recalled that the common-emitter output characteristics are IE plotted against VCE, and that the common-emitter current gain characteristics are IE plotted against IB. Because IC is approximately equal to IE, the common-collector output and current gain characteristics are practically identical to those of the common-emitter circuit. The common-collector input characteristics shown in Fig. 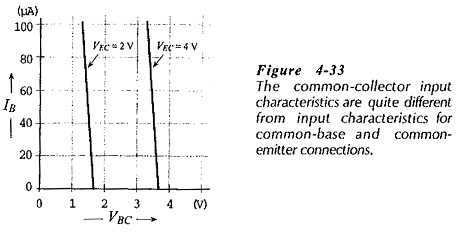 4-33 are quite different from either common-base or common-emitter input characteristics. The difference is due to the fact that the input voltage (VBC) is largely determined by the VEC level. Increasing the level of (input voltage) VBC with VEC held constant, reduces the level of VEB, and thus reduces IB.